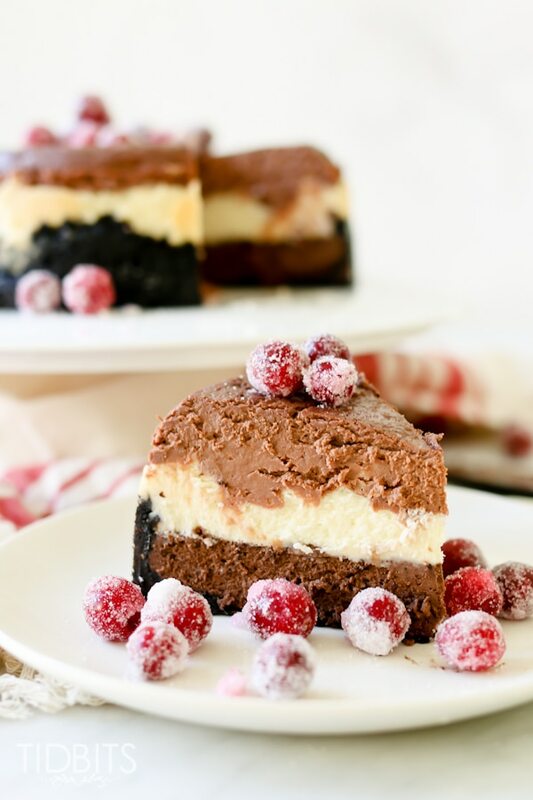 Wow your guests with this triple layered pressure cooker chocolate cheesecake. Or make it all for yourself-cuz you’re special like that ???? Have you ever noticed how particular people can be about their chocolate? Milk chocolate lovers gag when offered dark. Dark chocolate lovers have to buy anything and everything that claims it’s dark. White chocolate lovers think they love chocolate, not realizing that white chocolate is hardly chocolate. But everyone can at least agree on the fact that chocolate desserts will never disappoint in a crowd. Like never ever. Since get togethers are the name of the game for the next month (or every Sunday around my house) let’s make sure we make every chocolate lover out there happy and bring the milk, dark and white together in a harmonious creamy, dreamy cheesecake made by my favorite appliance (sorry oven), the electric pressure cooker. If you haven’t tried making cheesecakes in the pressure cooker yet, you are seriously missing out. The texture is like melt in your mouth fudge and I doubt I will ever make another cheesecake in the oven, ever. 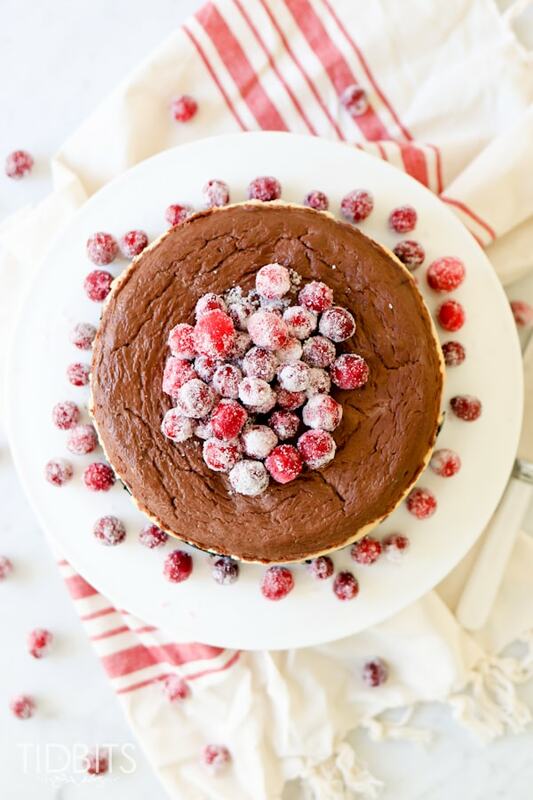 Believe me when I say this triple layered pressure cooker chocolate cheesecake is a complete joy to eat (eat one layer at a time? All three flavors at once? How to decide!). But let’s not overlook the fact that it is also show stopping and will earn you LOTS of oohs and aahs, which is always a bonus at parties! Bedazzle it with sugared cranberries (or crushed candy canes!) and display that baby on the pedestal it deserves! Happy Holidays everyone! Want more recipes from TIDBITS? Start your search HERE or learn how to use it by cooking your way through our Master the Electric Pressure Cooker Cookbook. IMPORTANT NOTE: I suggest either using an 8 inch springform pan (this set is less than $10 at Walmart and the 8 inch fits inside a 6 quart pot. If you have an 8 quart pot, any 8 inch pan will fit), an 8 inch push pan, or a 7 inch springform pan that’s greater than 3 inches deep. 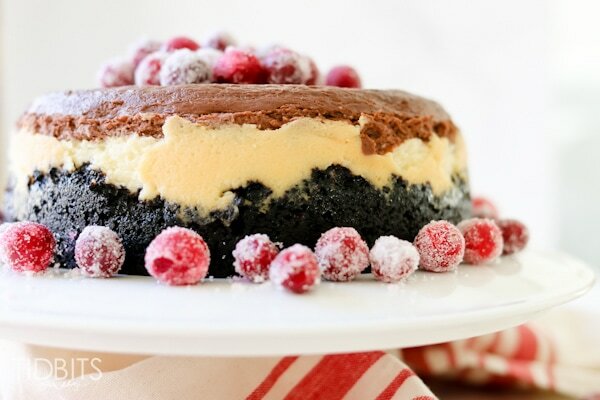 If all you have is a 7 inch springform pan that is 3 inches or less deep, simply use less batter for each level, then use the extra batter to make a mini cheesecake that you can then secretly stash in the back of the fridge for yourself (this can be done in a mason jar or mini springform pan). 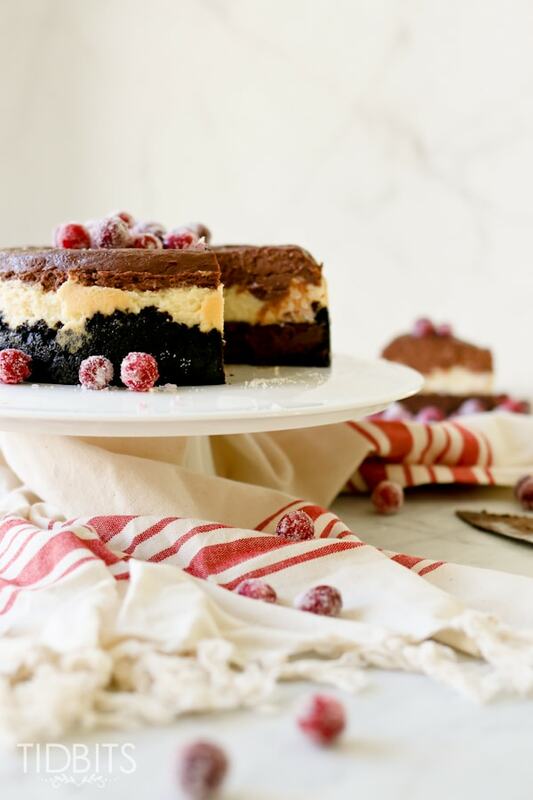 This triple layered cheesecake is every chocolate lovers dream and will be a showstopper dessert for any occasion! Spray a deep dish 7 inch springform pan with nonstick cooking spray (could also use an 8 inch springform pan as long as it will fit inside the pot, see pan recommendations in post above recipe). Line the bottom of the pan with parchment paper for easy removal of the cake once it’s done. Stir cookie crumbs and melted butter together and press evenly across the bottom and halfway up the sides of the pan. Place in the freezer to set (this can be done 2-3 days in advance). Cream the cream cheese with a handheld mixer on low speed until very smooth, scrape the bowl and mix again. Add sugar and cornstarch; continue to scrape and mix the ingredients together on low speed until well combined and smooth. Add eggs, one at a time, continuing to mix and scrape bowl as needed. Finally, add yogurt and vanilla and mix just until blended. Scrape the bowl and continue to stir by hand until smooth, if needed. Divide batter into 3 separate bowls (about 2 cups each). Melt the milk chocolate in the microwave for 30 seconds, stir. Return the chocolate to the microwave for another 15-30 seconds and stir until it is completely melted and smooth. Whisk into one of the bowls of cheesecake batter. Repeat with the white and dark chocolate (each being stirred into a different bowl of batter). Refrigerate the 3 bowls for 15-20 minutes so they will be more firm for layering. Remove the bowls from the fridge. Take the pan with the crust out of the freezer. Time to layer! Pour dark chocolate batter into the center of the crust and smooth to form an even layer. Very carefully spoon dollops of the white chocolate batter on top of the dark chocolate, gently smooth over the top (GENTLY so the layers don’t mix together). Repeat with milk chocolate batter. Add 1 cup of water to the pressure cooker pot and place trivet inside. Carefully lower the prepared pan onto the trivet. Secure the lid and turn pressure release knob to a sealed position. Cook at high pressure for 45 minutes. Remove pan from pressure cooker and let cool for 10 minutes. Slowly remove the springform ring, being careful not to break the crust. Allow the cake to cool completely and then cover and place in the refrigerator (at least 4 hours, overnight is best). Before serving, let stand at room temperature 30-60 minutes. Decorate with sugared cranberries, if desired. 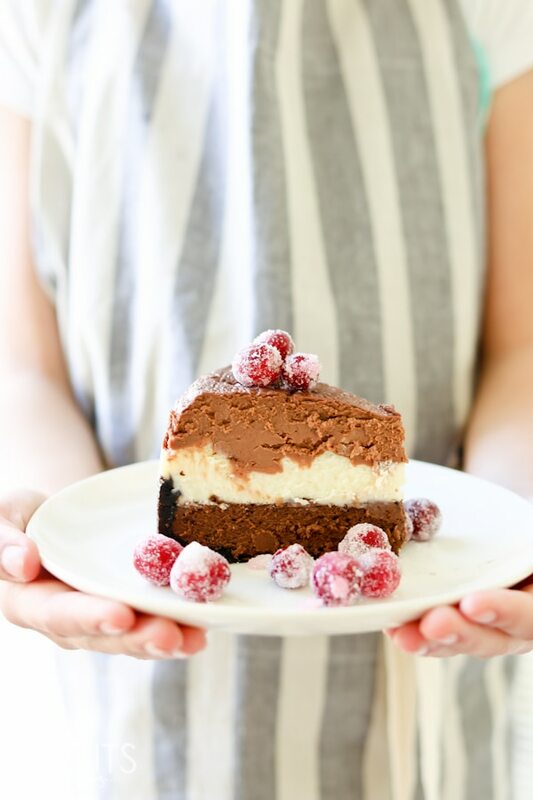 Check out this great post about making cheesecakes in the pressure cooker. Would this work by using less cream cheese and made Skyr yogurt? Beatrix, I’m honestly not quite sure. I’ve wanted to try that for some time but haven’t gotten around to it yet. Let me know if you try it! Thanks for the response. Will give it a try this way first and then see what happens. Haven’t made a cheesecake before because I live on my own and, well, I’d probably gain a ton of weight by over indulging (hah). Ohhh wooow! This looks really delicious! It is so mouth watering! Thank you very much for sharing this post! Thanks also for the recipe, for sharing it, this will be perfect for birthdays or some other special occasions. Evan, I dare say you won’t disappoint a single soul with this recipe! do you know how to adjust the ingredients for a “regular” cheesecake to make it suitable for a 7″ pan?? Adele, measure your pan, if it’s a true 7 inches, it should work. I have a pan that says 7 inches but measures 6 across and it’s too small. You can always put extra in a ramekin or mason jar and make a mini if there’s too much batter!